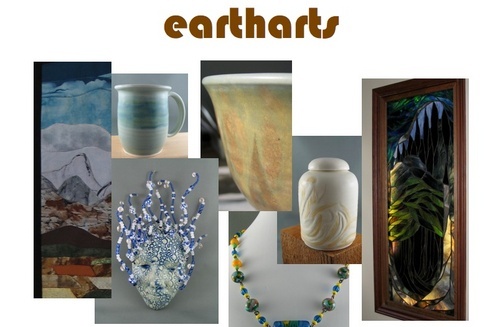 eartharts collects my creative work in fibre, fabric, clay, glass, metal and stone in one place. These materials vary greatly but all originate from the earth and I use them intentionally to honour their source. As the elements of fire, water and air blend with gifts of the earth, I craft pottery, glasswork, jewelry and fiberart. Working with clay is at the centre of my vision of myself as a creative person. After over 4 decades I consider myself to be a journeyman potter - skilled, but with still so much to learn! I believe functional pieces are meant to be used in daily life - bringing unique pleasure to mundane activities. My functional stoneware pots are safe for food, dishwashers, microwaves and conventional ovens - but not for use on the top of stoves or as storage in the freezer. Masks fascinate me. Originated to conceal, the making and choosing of them reveals so much! 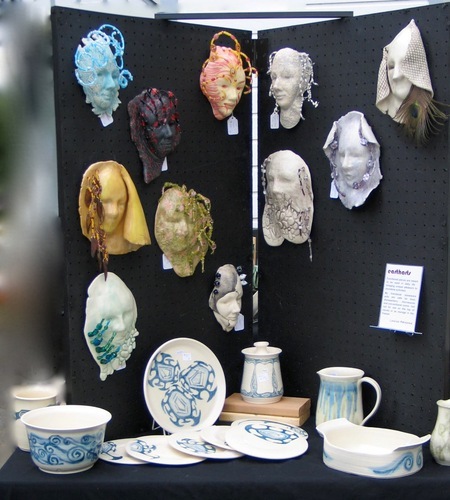 My masks celebrate that paradox - often combining clay with glass and taking full advantage of the incredible range of colours now available for stoneware temperatures. My website is the best way to view my current work. I welcome visitors, contact me by email to arrange.